An emergency demonstration of some 150 people took place in Dublin Saturday afternoon in Solidarity with those under police repression in Turkey. Check the WSM twitter for the latest updates from Istanbul and see our Fackbook album of the Dublin Solidarity demonstration. Cork Demo in Solidarity with Turkish Protesters - Thursday 6th June, 6pm at Daunt Sq. The following statement is copied from the callout for a solidarity demo in Cork this Thursday. On Sunday around 30 people attended a talk by Wendy Bacon organised by Jura Books im Sydney on the topic of anarcha-feminism and women's liberation. What did anarcho-feminism mean to 1970s feminists? Does it still have relevance for today's feminists? I have been in Istanbul for 16 hours, but already there is more to tell than I have the time to write. The purpose of the following blog is not to provide an in-depth analysis of the events that have lead up to the present situation in which I find myself, nor to provide a detailed scholarly analysis of the political, social and economic superstructure to which these events relate (one can find such things elsewhere and in time I intend to contribute to this), rather the purpose of this blog is to provide sporadic updates, quotes, interviews, links and images from the front lines of the as of yet unsatisfactorily termed 'Turkish Summer'. Today's Irish Times IPSOS poll results show the marginalisation of the catholic hierarchy and the anti choice movement. Both bodies have thrown everything they can into opposing the proposed legislation for the X case and rolling back the growing public support for wide access to abortion. The poll also demonstrates just how far behind the people are the political class when it comes to the issue. 1:Do you approve of the legislation? Yes - 75%, No - 14%. In the wake of this week's violent eviction of a squat in London, the state propaganda offensive is in full swing to intimidate and criminalise any opposition to the their savage anti working class agenda. Their divide and conquer strategy has been given an added boost by the organisers of this Saturday's march in Belfast city centre. Come to the Rossport Solidarity Camp, Pullathomas, Co. Mayo for a week of action in June against Shell’s Corrib Gas Project. This week has been called to coincide with one of Shell’s busiest work times. Come to act in solidarity with the 13 year old campaign in Mayo against Shell’s Corrib Gas Project. The week will be jam packed with a wide variety of actions! There will be something useful for everyone to do, regardless of your experience and skills. The Rossport Solidarity Camp is being erected specifically for this week, and will be taken back down when the week is completed. So if you are planning on traveling to Mayo this summer – make it this week! On 16th June Shell began the operation to lay an umbilical from landfall at Glengad to the Corrib Gas field. At 5pm, six kayakers from Rossport Solidarity Camp entered the waters of Broadhaven Bay, in order to protest against the imposition of the Corrib Gas project on the local community. The protest marks the beginning of two weeks of action against the project. Employed private sector worker seeks job in the public sector. This is surely an oxymoron... And also, “The cheek!” –Aren’t you lucky to have a job at all? Why would you want to join those leeching public sector workers, not only as a colleague, but also in protest?! The camp is open! - We'd planned to have the camp completed to welcome you all back on the 21st of June, but thanks to some great preparation work the camp is up ahead of time. Throughout June there has almost daily actions against Shell, mostly blocking haulage to Glengad. Read on for latest news & upcoming events. The main message is that the camp is open and there are loads of different ways you can help - spread the word and come on over! Yesterday I went to a funeral for a man who cared passionately for those who suffered at the hands of state cruelty. He campaigned tirelessly against racism in Ireland and for rights for immigrants. He himself suffered from depression and took his own life. It was a very sad funeral. The most successful G8 in Northern Ireland ever? At the post G8 press conference, PSNI Chief Constable Matt Baggot claimed the G8 summit in Enniskillen was the 'most peaceful and stable' in its history. The G8 gangsters may have left dazzled and wined by our local political class but beneath the media spin and smokescreen lies the ugly reality of a new Northern Ireland of one rule for the rich and powerful while the rest of us must accept our place in the ladder or face the consequences. We only need to look no further than the selective internment of Marion Price and others. 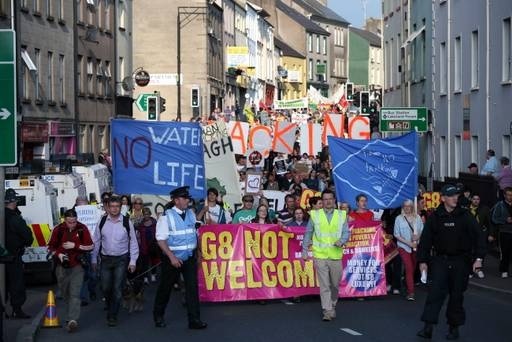 Monday's Anti-G8 march and rally through Enniskillen should undoubtedly be viewed as a huge success by everyone who attended it. Giving the fact of how the media, both the press and television, has played a full role in subjecting the population to weeks of sensationalist scare stories, it was a surprise that anyone even left their homes on Monday as the G8 leaders flew into Fortress Fermanagh. The first direct actions of the Erris struggle against Shell took place 8 years ago when 6 locals were injuncted and then 5 of them jailed for refusing to allow Shell onto their lands. In the 8 years that have passed there have been countless direct actions, dozens of arrests, about two dozen jailings and hundreds of people attacked by Garda or Shell's security company IRMS. But as the first two days of the week of action demonstrated that intense level of repression over so many years has yet to end effective resistance. So this morning, a strike by Stockholm’s bus drivers union Kommunal began in protest against pay cuts and the lack of security in new contracts for workers. Seems like a legitimate grievance? Not according to the right wing Swedish students group, Fria Moderata Studentförbundet (FMSF), who have decided to attempt to break the strike. Or more accurately, to troll ordinary people trying to stand up for themselves and their families livelihoods by driving mini-buses on two of the routes. Andrew Flood, member of Workers Solidarity Movement, will give an eyewitness account of the state brutality against people in Istanbul, where he spent a week recently. Sevinc Karaca, an anarchist from Turkey, will give details of the background of the struggle. The talks will be accompanied by photos & video from Gezi park.